More precise tracking data has recently become available that gives new insights about how MH370 was flown just before the transponder was disabled near the waypoint IGARI. The data was broadcast by the aircraft and received by a Malaysian ATC receiver at Terengganu. It is similar to the data that has been previously available from the aircraft tracking site FlightRadar24, except that the spacing between data points is shorter, and the data are the raw values that were actually broadcast by the aircraft. As a result, more details about the flight can be extracted. The new tracking data was transmitted by the aircraft’s Automatic Dependent Surveillance – Broadcast (ADS-B) system, which broadcasts the GPS-derived position and altitude, as well as other parameters, as often as about every one-half of a second. Because of the inherent accuracy of GPS, the ADS-B position is more accurate than the traditional radar systems, which derive the position from the timing and angular direction of received signals from the aircraft using a rotating antenna. A file containing the ADS-B data for MH370 is available here. The figure below shows that the aircraft was on a track to pass over waypoint IGARI. However, before reaching IGARI, the aircraft began to turn towards waypoint BITOD. The radius of the turn indicates that the bank angle was around 15°. The start of the turn before reaching the waypoint and the bank angle are both consistent with the aircraft following an automated route in “LNAV” mode in which the flight computers were programmed to fly “direct” to IGARI and then to BITOD. (IGARI is a compulsory “flyby” waypoint.) This suggests that at the time the transponder was disabled after 17:20:34.55, the autopilot was still engaged and the aircraft was flying in accordance with the flight plan. (The Safety Investigation Report states that the Mode S symbol dropped off the radar display at 17:20:36, which is close in timing to the last ADS-B point.) This is evidence that the deviation from the flight plan occurred after the transponder was disabled. Unfortunately, after many requests, the raw military data of MH370 has never been released by the Malaysian authorities. What we do have are low resolution images from official reports that depict the path of the aircraft. We also have filtered speed and track data that has been digitized from graphical data presented in a report from Australian authorities. Neither of these data sets provides the level of resolution and accuracy that would allow us to independently study the details of the path after passing IGARI, including the details of the turnback. 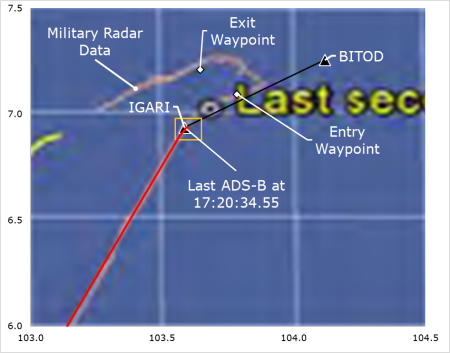 The figure below shows the military radar data (fuzzy yellow line) that was officially released in a low-resolution image, and enlarged here to show the path near IGARI. In the image, the bulls-eye was labeled “Last secondary radar data 1722”. For reference, the waypoints IGARI and BITOD were added to the image, as well as the ADS-B data (red) and the IGARI-BITOD route leg (black). The box (orange) around IGARI represents the much smaller area shown in the previous image. There are some obvious discrepancies between the military data shown above and the ADS-B data shown in the previous figure. For one, the military data shows the turn towards BITOD starting after passing over IGARI. This “flyover” of IGARI is not consistent with how an aircraft following an automated path during the cruise part of the flight would turn between waypoints. If this path was actually flown, it would suggest that the navigational mode was not LNAV near IGARI. The location of the last ATC radar point (the bulls-eye) is also different in this image from what the ADS-B data suggests. The ADS-B data shows that the transponder was disabled when MH370 was abeam IGARI. However, the image above shows the last ATC radar point occurring after the turn towards BITOD was completed. This could be because what is shown was extrapolated from the final transponder reply in what is referred to as “coasting”. The military data also shows an impossibly sharp turn to the left occurred. Despite numerous requests, Malaysian officials have never provided an explanation for the false depiction of this turn. These discrepancies indicate that the military data near the turnback should be used with caution. It’s possible that the radar installation that captured the turnback was Western Hill on Penang Island, and the turnback was near the maximum range of the radar site. (IGARI is about 220 NM from Western Hill.) If so, the inaccuracies might be from limitations of the military radar coverage this area. As such, the path depicted in the image may have been extrapolated from missing or inaccurate data, and should be assigned an appropriate level of uncertainty. Finally, shown in the figure are the “entry and exit waypoints” of the turn that were supplied by the military and used by Malaysian safety investigators to study how the aircraft was flown after IGARI. As described in the Safety Investigation Report, simulations performed by the Malaysian investigative team matched the timing and position of the entry and exit waypoints of the turn only when the aircraft was manually flown with a steep bank angle of around 35°. However, considering the suspected inaccuracies in the military data, the conclusion that the turnback was manually flown should be re-visited. For instance, if the turn was begun prior to the entry waypoint, it would be possible to reach the exit waypoint at the proper time with a bank angle of 25°, which is a selectable bank angle when either of the autopilot modes “Heading Select” or “Track Select” is chosen. During the time that the transponder was operating with altitudes reported, it was either in the switch position designated “TA/RA” for full functionality, or “TA ONLY” to suppress Resolution Alerts, or “ALT ON” to suppress both Traffic and Resolution Advisories. (TAs and RAs are part of the aircraft’s traffic collision avoidance system.) In order to select STBY from one of these three positions, it’s required to pass the intermediary position labeled “ALT OFF”. In this position, the transponder is replying to interrogations and is transmitting ADS-B data. However, there is no altitude data included in the replies and broadcasts. The time interval between the last radio transmission from the crew and the first message with no altitude reporting is 64 seconds. If the diversion from the flight path was caused by a third party forcing their way into the cockpit and taking control, those events would have to have occurred in 64 seconds or less. It is very unlikely that this could have been achieved by a third party in such a short amount of time. 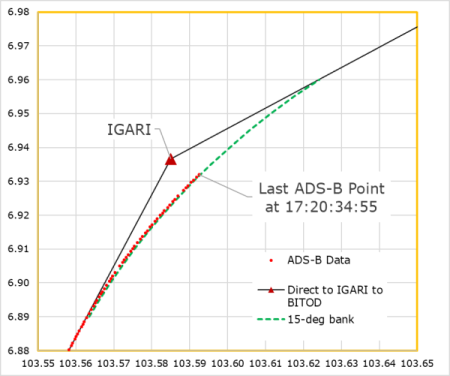 At the time the transponder was disabled near IGARI, the ADS-B data shows a path that is consistent with normal automated flight in LNAV mode following a programmed route from IGARI to BITOD. Discrepancies near IGARI between the ADS-B data and the military radar data suggest that the radar data has inaccuracies possibly because of the range limits of the radar installation on Western Hill on Penang Island. The Malaysian investigators’ conclusion that the turnback after IGARI was manually flown should be re-visited in light of the demonstrated limited accuracy of the military radar data near IGARI. The final ADS-B points may have captured an intermediate switch position as the transponder’s selector switch was rotated towards the standby position. After the last radio transmission from MH370, the maximum time available to disable the transponder and divert the aircraft was 64 seconds. That leaves an impractically small amount of time for a third party to enter the cockpit and take control. We now have better ADS-B data for understanding how MH370 was flown up to the point that the transponder was disabled at 17:20:35. This complements the primary radar data from Kota Bharu that starts at 17:30:33. However, we are still missing the military radar data that would cover the 10-minute gap between these two data sets. That gap includes the left turn at the start of the diversion that put MH370 on a course back over Malaysia. It is important for Malaysia to release this closely-held military radar data so that other investigators that are working to solve this mystery can perform independent analyses of how the aircraft was flown during the turn back to Malaysia. Whatever strategic reasons there might have originally been for withholding the military data are no longer relevant more than 5 years after the disappearance. Fellow IG members Mike Exner and Don Thompson have provided valuable comments to this article.